The retina is the inside lining of the eye. It is a very thin layer that is made of nerve tissue like the brain and spinal cord. The retina is akin to the film in a camera. Pictures taken by "the camera", our eye, are imprinted on the retina and this information is passed onto the brain through our natural cable, the optic (eye) nerve. The brain interprets the image so that we then know what we are looking at. Floaters or moving black, cobweb-like "strands" or "hairs" in the vision are a common symptom of a posterior vitreous detachment. The vitreous is the gel that takes up most of the space inside the eyeball. This vitreous gel sits right on top of the retina. As we age, the gel becomes more watery, and starts to peel off from the retina. Sometimes, as it is peeling, it pulls on the retina and creates a flashing sensation (because the retina sees light when pinched). This pulling can sometimes be traumatic to the retina and tear it. Retinal tears can be pulled into a larger tear, or a detachment. When anyone has symptoms of floaters or flashing light sensation, it is important to check the retina to make sure it is not torn. If it is torn, it will need to be lasered shut. Most people only have a posterior vitreous detachment (PVD) without a retinal problem and just need to be checked with a dilated retinal examination. A PVD by itself is not harmful, but can create chronic floaters that can be a nuisance. These floaters will always physically be present and are not generally treated. However, people notice them less over time since the brain starts to ignore them. The retina can become spontaneously torn when the gel or vitreous that sits over it in the eye slips off or separates from it. This can happen with aging changes (earlier in near-sighted people) or with sudden trauma. This is called a posterior vitreous detachment. Most of the time, the vitreous separates without tearing the retina. However, occasionally, when the retina is torn, the tear can get larger causing a retinal detachment. This means that the retina has peeled off from the inside. When the retina is detached, its cells are no longer attached to its blood and nutrient supply. The retina cannot work properly when detached. People with a detached retina cannot see in the area of the detachment. 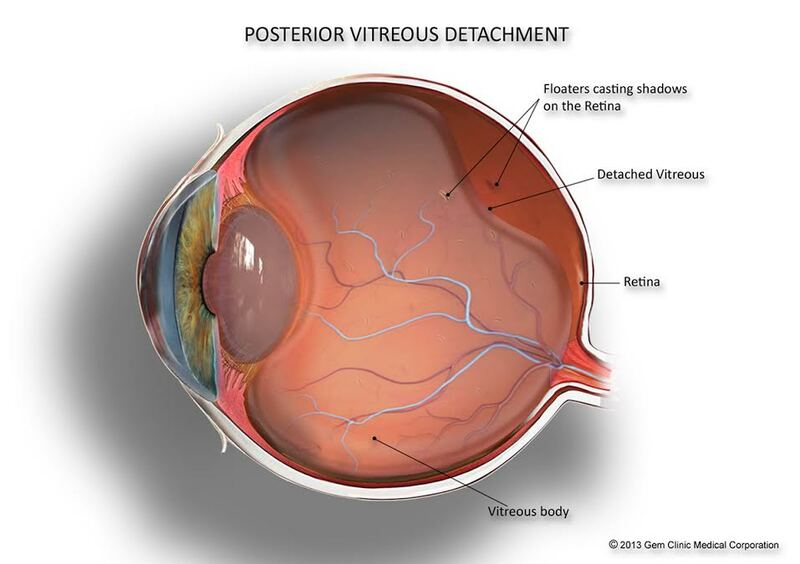 A person with a retinal detachment may feel like a curtain came down from above or from the bottom or either side (depending on where the detachment is) and is blocking the vision. When a person has a complete retinal detachment, there is no vision, except perhaps perception of light. If a person is examined and found to have a retinal tear, this can be lasered shut before it extends into a detachment. An Ophthalmologist can usually laser a retinal tear, however, sometimes if the tear is larger or farther out, you may have to be referred to a retina specialist for this treatment. If you are getting retinal laser at GEM clinic, you will first be seen by the technician and dilated with dilating eye drops. The dilating drops take at least 20 to 30 minutes to work. Once you are dilated, you will be called to the laser room. The doctor may wish to re-examine you prior to the laser. You will be given eye drops to numb the eye prior to laser treatment. A lens with a layer of lubricating gel will be placed on your eye to hold your eyelids back and direct the laser. This will feel strange but does not cause pain. You may feel the lens moving slightly as the doctor directs the laser. The laser itself may cause a prickly sensation, but usually does not feel like much. If it is causing pain, please let your doctor know and (s)he can lower the power, which should ease the pain. This procedure usually takes about 5 minutes. You may experience blurry vision after laser, and possibly light-headedness. You should have a driver or take a taxi home. You do not need any eye drops after this laser. You will be given a follow-up appointment for 4-6 weeks time to ensure that the laser is healing well and that the tear is well-surrounded and sealed by the laser. If you experience further symptoms of floaters and flashes or any changes in your peripheral or side vision that are different from what you experienced at the beginning, you will need to be re-examined since there could be additional retinal tears or a retinal detachment that may have developed. Call your Ophthalmologist during office hours or go to your nearest emergency department during evenings and weekends. 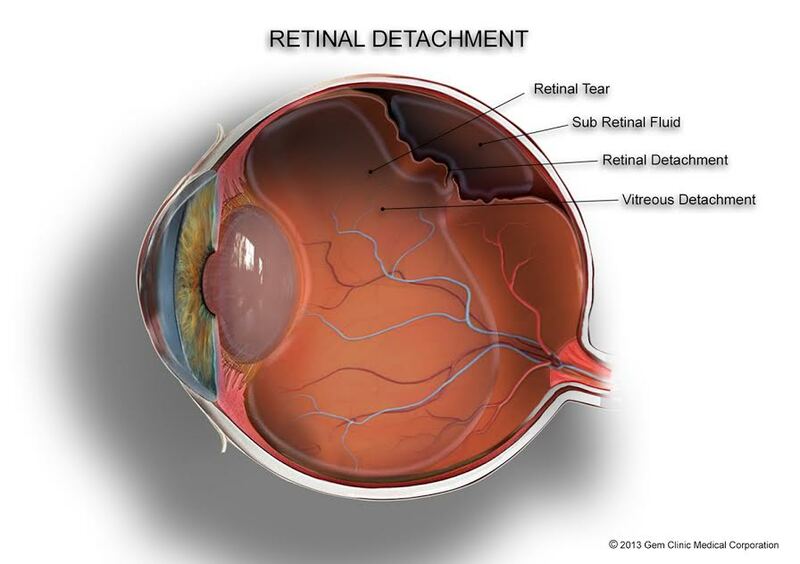 When the retinal tear extends, more of the retina can peel off the back and lead to a retinal detachment. This leads to loss of vision that can be permanent if left alone. A RETINAL DETACHMENT is an eye emergency and if you think you have one, you need to go to the emergency department at once. You will be seen by the emergency physician and then urgently referred to the on call Ophthalmologist for assessment and treatment. Repair of a retinal detachment is usually done within 24-48 hours of the detachment. These repairs require a retina specialist, therefore if you are seen by a general Ophthalmologist, you will be urgently referred to the retina specialist for consultation and laser/surgery. Repair of a retinal detachment is more successful if diagnosed and treated early. If you wait for several days to weeks, it may not be possible to fix the detachment and you may have permanent loss of vision in the affected eye.